276 pages | 77 B/W Illus. While the analysis of a civil-engineering structure typically seeks to quantify static effects (stresses and strains), there are some aspects that require considerations of vibration and dynamic behavior. Vibration Analysis and Structural Dynamics for Civil Engineers: Essentials and Group-Theoretic Formulations is relevant to instances that involve significant time-varying effects, including impact and sudden movement. It explains the basic theory to undergraduate and graduate students taking courses on vibration and dynamics, and also presents an original approach for the vibration analysis of symmetric systems, for both researchers and practicing engineers. Divided into two parts, it first covers the fundamentals of the vibration of engineering systems, and later addresses how symmetry affects vibration behavior. Part I treats the modeling of discrete single and multi-degree-of-freedom systems, as well as mathematical formulations for continuous systems, both analytical and numerical. It also features some worked examples and tutorial problems. Part II introduces the mathematical concepts of group theory and symmetry groups, and applies these to the vibration of a diverse range of problems in structural mechanics. It reveals the computational benefits of the group-theoretic approach, and sheds new insights on complex vibration phenomena. Vibration Analysis and Structural Dynamics for Civil Engineers: Essentials and Group-Theoretic Formulations acquaints students with the fundamentals of vibration theory, informs experienced structural practitioners on simple and effective techniques for vibration modelling, and provides researchers with new directions for the development of computational vibration procedures. "… a valuable addition to the structural dynamics literature. In particular, the final six chapters provide a clear, concise and readable account of the group theoretical basis for simplifying the analysis of symmetric structural dynamical systems. … the book’s author presents an application of some of his own research work on group-theoretical formulations aiming to simplify the modelling of structures with symmetry." "… a novel approach to the vibration analysis of symmetric systems. 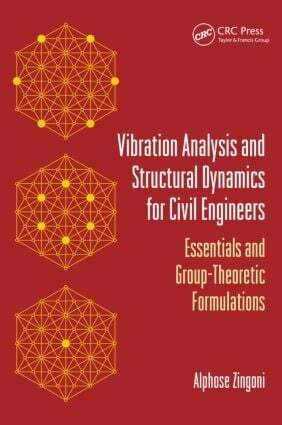 …the book provides comprehensive guidance for students, practitioners and researchers interested in the essentials and group-theoretic formulations of vibration analysis and structural dynamics." "Strengths of the book are the simplicity and clarity of explaining the basics of structural dynamics, including some worked examples and tutorial questions." "This is a fabulous book, written by a true expert in the field. It is rigorous, but accessible, and it helps to simplify some of the most important but complex dynamics phenomena through an innovative link to the mathematics of group theory. This is a book I must have on my book shelf." "This book is well written and looks at an important topic in civil engineering education. It progresses from a fundamental treatment at undergraduate level to advanced topics at postgraduate coursework level and postgraduate research studies." Alphose Zingoni is professor of structural engineering and mechanics in the Department of Civil Engineering at the University of Cape Town. He holds an M.Sc in structural engineering and a Ph.D in shell structures, both earned at Imperial College London. Dr. Zingoni has research interests encompassing shell structures, space structures, vibration analysis, and applications of group theory to problems in computational structural mechanics. He has written numerous scientific papers on these topics, which have been published in leading international journals and presented at various international conferences worldwide.